Sabine Meyer has been playing clarinet since she was eight years old. Early in her career she earned worldwide attention when she became the first female member of the Berlin Philharmonic, serving as principal clarinet. Now she performs only as a soloist or in chamber music settings. Meyer has known Ukrainian pianist Oleg Maisenberg for many years. "It's always exciting to play with him, always new," she says. On their latest joint recording, they offer a stimulating program of French chamber music with works for clarinet and piano by Saint-Saens, Poulenc, Milhaud and Devienne. Francois Devienne was an 18th-century bassoonist-turned-composer now known best for his comic operas. Before he gained that reputation, Devienne wrote chamber pieces for woodwinds, including the sonata that's on this new release (originally composed for flute and piano). The piece features some of the qualities that appealed to the opera public in the 18th century: songlike melodies, simple harmonies and virtuosic solo writing. Pianist Oleg Maisenberg opens Devienne's sonata with an alluring melody. Meyer quickly joins in, illustrating the clarinet's ability to keep up with the finest soprano as she easily navigates through challenging scales and arpeggios. The slow movement of this sonata is truly breathtaking. Meyer's warm tone is like a soft blanket, gently wrapping itself around my ears. Sometimes the clarinet repertoire can come off seeming a bit cold, or too refined. Meyer's elegant reading of this tender adagio melts away any misconceptions about the clarinet's ability to be heartfelt. While Camille Saint-Saens started off as an open-minded, radical composer, later in life he grew much more conservative, declaring, "Music written in two keys at once will never be more than a filthy racket." To prove his point, he wrote his Sonata in E-flat Major for Clarinet and Piano. He clearly states and re-states the key signature in the first movement. In the slow movement, he contrasts the two extreme ranges of the clarinet. Heavy piano chords accompany the clarinet as it lingers in the low, "chalumeau" register. While this introduction to the slow movement is almost dissonant, the mood changes as the piano plays a few slow, calculated arpeggios. The clarinet then returns in its high, "clarino" register. It's not easy to play in that upper register, yet Sabine Meyer does it effortlessly and with tremendous grace. Saint-Saens' remark about the "filthy racket" was a reference to a chamber piece by his much younger contemporary, Darius Milhaud. Milhaud wasn't afraid to experiment and we hear a bit of that in another piece on this new disc: "Scaramouche." It's an arrangement for clarinet and piano of incidental music Milhaud composed for a production of Moliere's comedy "The Flying Doctor" (Le Medicin Volant). In the hands of Meyer and Maisenberg, "Scaramouche" is far from "filthy racket." The first movement is pure frivolity, with Meyer playing mouth-dropping runs that make me wonder how on earth she ever manages to squeeze in a breath. 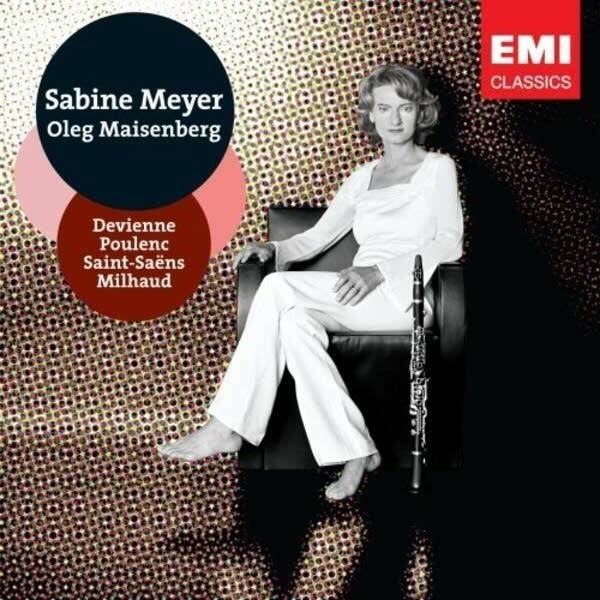 When she performs with pianist Oleg Maisenberg, clarinetist Sabine Meyer claims their music-making is always exciting, always new. The proof is in the pudding, which makes this new collection of French chamber pieces a delectable creme brulee.